What is the most important trait that you hope you instill in your child? I have never been asked this question by anyone, but I think I would answer the question with the answer -- perseverance. I have often questioned and struggled in the past whether I am doing enough to teach my children to be strong, hard workers who will never quit when presented with an obstacle. Through recent observations of my children I have come to the conclusion that perseverance may not be something I need to teach. My youngest daughter, eight months old, has persevered on her own in her quest to move around the house. For weeks she worked to teach herself how to get her legs and body into position to crawl. Now that she is crawling, she is trying to move faster and more efficiently. It won't be long until she will be pulling herself up, standing, taking steps, falling, walking, falling more and then falling less. I think kids naturally have perseverance -- my two-year-old reminds me of this every day. I have realized that is not my job to instill this trait but to support them, encourage them, and dust off their boo-boos during their times of self-discovery. Ed Young has published over 80 books for children including the 1990 Caldecott Medal Winner Lon Po Po: A Red Riding Hood Story from China and two Caldecott Honor books Seven Blind Mice and The Emperor and the Kite by Jane Yolen. He was born in China and grew up in Shanghai. I emailed Ed to ask if he would share a birthday memory or story and he responded with, "I was born in the year of Japanese invasion of Manchuria which had set the stage for WWII in the far east. I was named after a Canadian who volunteered to fight for the Chinese cause against the aggressors. He had been my inspiration to sustain our troubled world. Which is why I stayed in children's books." 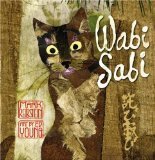 After coming to the United States to study architecture, he worked in advertising, and then found his way into children's book publishing. His career has been full of successes and awards, but also many obstacles. In an interview with PaperTigers, Ed Young talked about his recent book House that Baba Built: An Artist's Childhood in China, an autobiographical book about growing up in a "big brick house" built by his father. Creating the book wasn't easy. He approached recounting his experiences in the house in many different forms until he finally decided that it was best to tell a very personal story. "This published book is the fifth time around for me. So, I had four books that were pretty much ready to go. I think each time was a little better than the last. Each version was valid as a step and meant that I could proceed with the next one fairly quickly, once I had the concept in my head." In the book Foolish Rabbit's Big Mistake by Rafe Martin, Ed Young initially struggled with the illustration style, but found a way to persevere. "I allowed myself to use a medium appropriate to the story that was outside of its tradition, which in this case would have been Indian miniatures." (Cynsations). artwork early, and then it went missing. This unfortunate event was not seen as an obstacle but an opportunity. "It gave me time to ponder over what can be improved upon and then when I wanted to recreate something as I know I can not recreate exactly like it was before. I wanted to see what I can use to make it a better book." (BookVideosTV, video below). Eventually, the original art was recovered, but not until after the new art was used for the book. 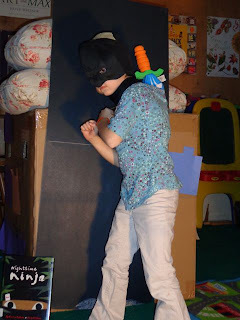 In his latest book, Nighttime Ninja by Barbara DaCosta he told Horn Book that "Nighttime Ninja went through many stages: first it came in pencil, then charcoal, then pastel, and then I used ink markers, and finally I completed the whole thing with collage." 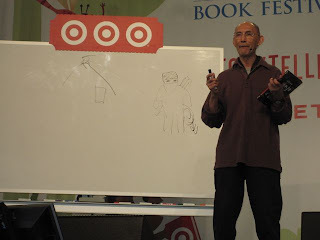 This past September 2012, my family and I attended the National Book Festival in Washington D.C. Our favorite place to hang out was the Family Storytelling Stage where authors and illustrators read their latest books. Ed Young read Nighttime Ninja and his enthusiasm for the book was very apparent. 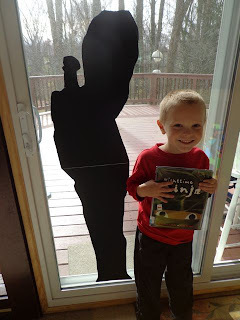 That day he shared with us that "I would have loved this type of picture book as a young boy." From the moment I heard Ed Young read the book, I wanted it to be the the book we used for his birthday celebration -- however at the time I didn't know his birthday. Luckily, I was able to meet Ed and he graciously shared his birthday after he signed a book for my children. Ed Young speaking at the National Book Festival. The endpapers and illustrations from Nighttime Ninja are full of ninja silhouettes. My idea for a birthday celebration was to make life-size ninja silhouettes of my children. This proved to be more difficult than I thought. However, now that we have experienced all the obstacles in creating this project initially, I am confident that you will be able to replicate this project without much trouble. 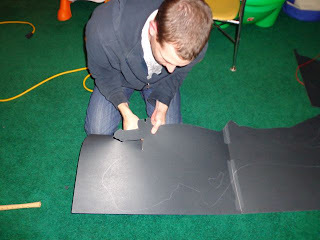 The first obstacle was finding black paper large enough to make life-size ninja silhouettes. The easiest and most cost effective way for us was to use black poster board. Each ninja silhouette required two pieces of standard sized poster board taped together with masking tape. 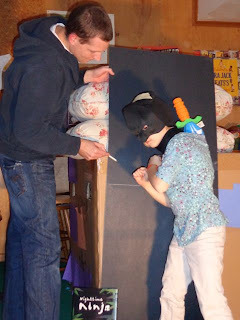 The second obstacle was basically my inability to explain to my children what we were trying to accomplish. 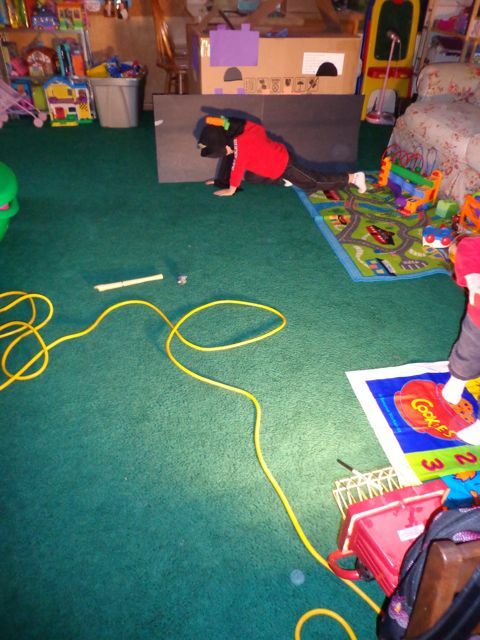 My five-year-old son bounds around the house all the time -- kicking, sliding, crawling with ninja-like movements. I just assumed he could act like a ninja when I needed him to be one for this project. I learned that making ninja moves was easy for him, but holding ninja poses was very difficult. We initially tried a crawling pose, but I couldn't get him to look natural -- his bottom sticking high in the air, then his head was on the floor. Finally, I said "Let's tape the paper to the wall by the couch." I thought climbing on the couch would give a natural pose which would give the perfect shadow that I could trace. However, this didn't work either and I am surprised he didn't get hurt! Yep, I almost lost him between the wall and the back of the couch! So we moved back to the floor, both of us were very frustrated, and I asked him to try once more to make a ninja pose as if he was crawling. I was so proud of him. He found a pose that was comfortable, and was able to hold it long enough for me to trace the shadow (about 45 seconds). My son wore his Batman mask (with the ears taped down) and a cape wrapped around his face and next. Also, we stuck a sword down the back of his shirt. These two things allowed the shadow to look as if he was in full ninja gear. Next, we did a standing pose. This pose should have been the one I had him do first. 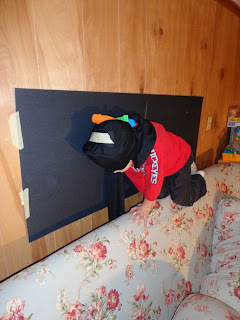 (It is easy to stand there and "Be a ninja"!) He would have been able to see the end product and understood what we trying to accomplish. I used a white pencil to trace his shadow. He was so excited to see the finished product. It was worth it! 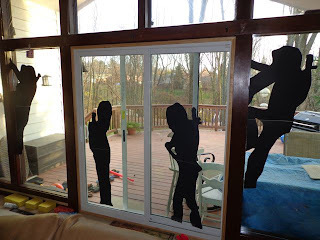 As soon as my daughter came home from school, she wanted to make a couple ninja silhouettes too. 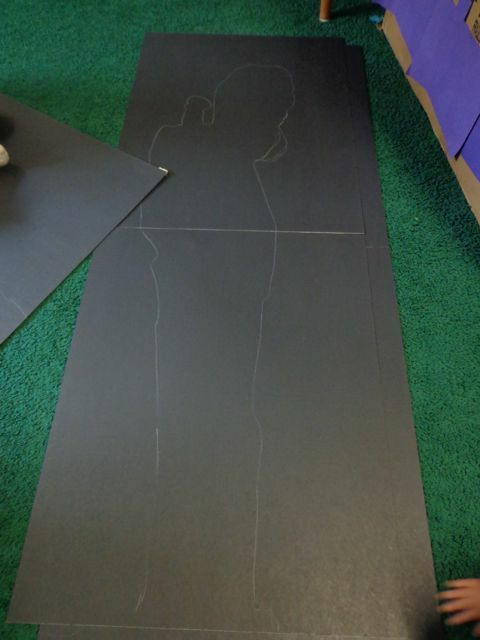 I cut out all the ninja silhouettes because of all the twists and turns. Lastly, we taped them all on our porch windows. Our house is now protected by ninjas! Thank you Ed for sharing your birthday and for responding with a birthday story. We really enjoyed reading many of your books this week and we hope you have a joyful birthday. I love Ed Young's work and I enjoyed seeing him on video- such a gentle demeanor. LOVE your life-size ninjas. Fun!